IsaLean Bars offer an ideal solution for a hectic lifestyle as a delicious, nutritious meal you can enjoy no matter where you are. Not only do they provide a complete, low-glycemic meal replacement with perfectly balanced nutrition, they also have the ideal ratio of carbs and protein for pre-workout fuel without spiking blood sugar levels for more sustained energy. As you probably already know, it can be tough to eat right on the go. When nothing healthy is readily available, most of us simply turn to whatever is at hand, and often not the healthiest choice. 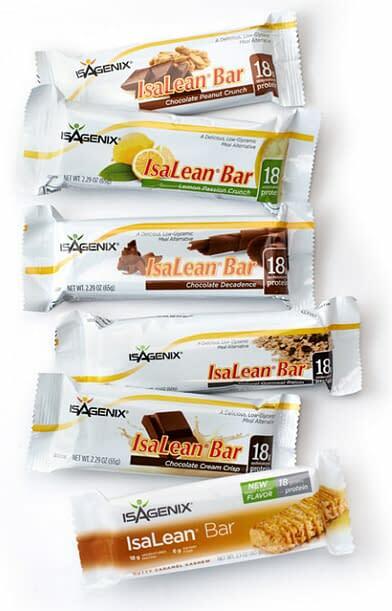 By keeping an Isagenix IsaLean bar on hand, you’ll be much more likely to stay on track to meet your weight and nutritional goals. NEW Dairy-Free IsaLean Bars Now Available! 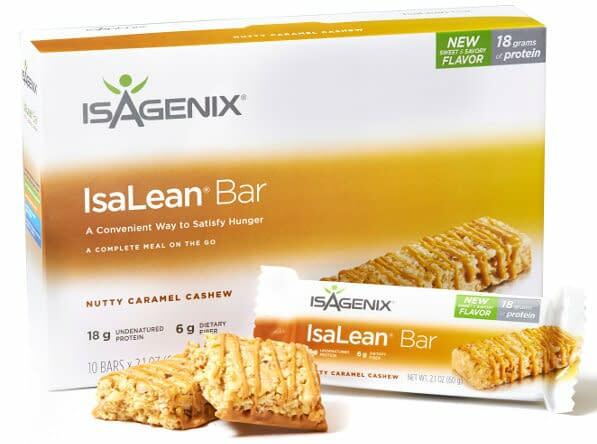 Available in two great flavors these new plant based Isalean bars are a great alternative for people who need to avoid dairy. Order direct from Isagenix to enjoy the lowest prices & 30-day money-back guarantee (on your first order). 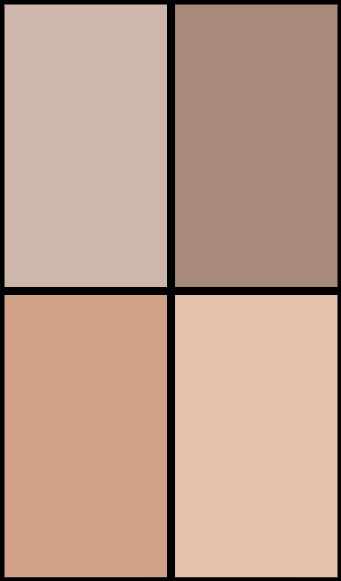 Available in 8 delicious flavors. 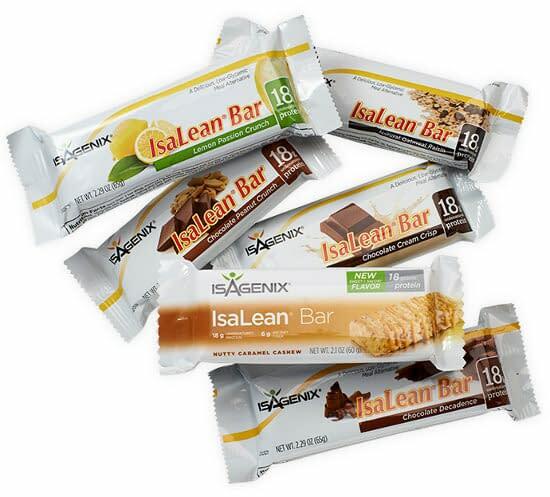 Using IsaLean Bars as meal replacements or as healthy snacks can help you stay on track to meet your weight loss goals. Compared to other meal replacement bars, this product contains superior nutrition with balanced nutrients including healthy fats, undenatured quality protein, energy-fueling carbs and minimal calories to promote safe and effective weight loss. These low-glycemic bars provide the perfect ratio of carbohydrates and protein for pre-workout fuel to enhance weight training and high endurance activities – and, they won’t spike blood sugar levels, allowing for more sustained energy. IsaLean Bars are perfect for those with an active, busy lifestyle and can even be enjoyed by children ages four and up. They’re gluten-free, low-glycemic and kosher. Sign-up as an Associate to receive wholesale prices (autoship can be cancelled at any time). This product is not currently available in Australia. Recommended to be used together with a complete nutritional cleansing program. Hunger pangs are one of the biggest reasons dieters get off track. When they suddenly hit, you’re likely to lose focus and you may even become dizzy, which means all you probably want to do is turn to whatever happens to be nearby – often not the healthiest choice. These powerfully nutritious meal replacement bars can become one of your best tools for helping you to fight against stubborn pounds and meet your nutritional goals. In fact, research has found that dieters who use meal replacements lose an average of double, or even triple, the amount of weight as those who don’t! They’re not only convenient, but they can also help you save calories by avoiding unhealthy, fatty foods, as well as to avoid underestimating calorie count. IsaLean Bars can also help keep your sugar levels balanced, allowing your body to burn stored fat as fuel and even boost energy levels too. These tasty bars are not only great for those who are trying to lose weight, but they’re perfect for enhancing athletic performance too; including both strength training and high endurance activities. As they don’t cause a spike in blood sugar, they allow you to enjoy the sustained energy you need for a lengthy workout. When you’re hungry between meals and need a healthy snack, the bars are a perfect solution too. Just cut them in half and use them as snacks to help fuel your activities throughout the day. As they’re individually packaged, it’s easy to keep a few stashed away in your desk, purse or briefcase. The kids will love them too! Approved for children ages four and up, IsaLean Bars make a fabulous after-school treat, with whey protein that’s low in lactose and high in branch-chained amino acids – important for promoting growth and maintaining muscle. These bars really were the perfect solution to my ridiculously busy life. Every afternoon at work I ended up frustrated and cranky and didn’t get anything done because I was hungry. I started using Isagenix products and fell in love with these bars and the rest is history! I am an avid runner, and the snack that I used to eat every afternoon before running just wasn’t cutting it anymore. These IsaLean bars have totally revolutionized my run; I have so much more energy at the end than I ever did before. I think my kids love these IsaLean bars even more than I do! I end up having to buy extra boxes all the time because I go to get one to have for a snack and they’re all gone again. I’m even looking into the other Isagenix products now. Getting hungry between meals is a problem when you work really hard every day, but only get one break that you have to use very wisely. I started eating IsaLean on my break because they’re healthy and I can eat them fast, and now I feel great when my shift is over. Why does the type and amount of protein matter so much? High quality protein is essential for supporting weight loss, lean muscle building, and to leave you feeling satisfied, reducing the chances of giving in to cravings. Dieting is often associated with uncomfortable hunger pangs that come from cutting calories. Scientific studies have shown that consuming meal replacement bars can help curb your appetite and lead to safe, sustained weight loss. The type of protein is also important. Whey, used in the IsaLean Bars, has been found to promote fat loss and satiety more than any other type of protein when combined with regular exercise. This kind of protein, referred to as undenatured, is its most natural and unprocessed form, additionally offering antioxidant benefits to support optimal health. Carbs, in the form of starches and sugars, are important for delivering the body a steady source of energy for a longer period of time. Foods that are high-glycemic, which means they contain fast-absorbing sugars that don’t offer much fat, protein or fiber, are linked to spikes in blood sugar. That’s often followed by a crash, and then hunger. All flavors are low-glycemic to ensure a steady source of energy to keep you feeling satisfied longer. 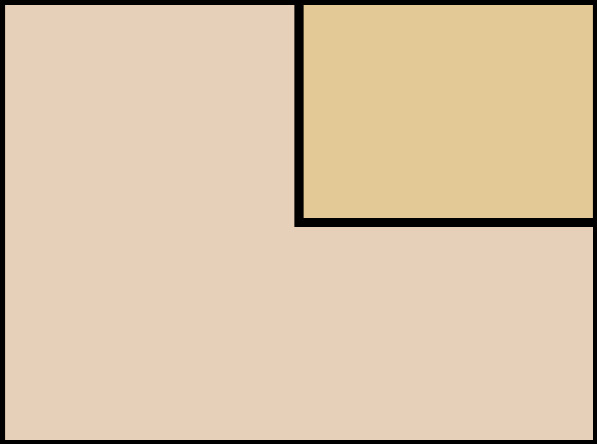 Eat one bar as a meal replacement when it is not possible to have an IsaLean Shake, or enjoy as a snack (cut in half). Each bar is individually wrapped and available in a 10-count box. IsaLean Bars come in eight delicious flavors (including 2 new dairy-free options!). 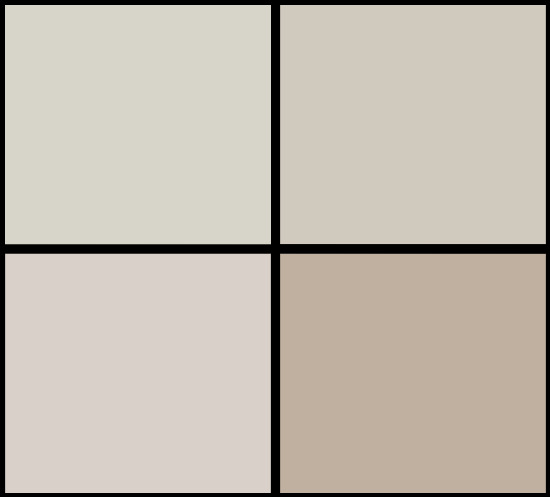 Please click on the individual links below to view the full ingredient list and nutritional information panel. If you want to stay on track to reach your weight loss, fitness and health goals, there may be no better way to do it than by stocking up on Isagenix IsaLean Bars today!